After ten years of adventures visa-related, the time to end this story of annual meetings, endless trips, rule changes, frustration, had finally come. In short, I completed in August two years of marriage, which gave me the right to apply to become an Overseas Citizen of India (OCI), some kind of lifelong visa allowing me to live and work in India. Lifelong if you please! Well, at least as long as my marriage stands. Because it is the fact that I am married to an Indian person that gave (earned??!) me the right to this illustrious honor. When he was done laughing, he, in all seriousness, informed be about a (not so) funny rule: one must have lived for more than eight months in a city to apply (not six or twelve, no, eight). Obviously, this is mentioned nowhere on the site and obviously, I am far from it, having three months to complete. 24 months that I have been waiting and this jocker comes up with this crazy rule! I could cry. Maybe that’s why, seeing my face – or maybe I got a bit upset and yelling and shouting, I can’t remember – the officer accepted my file not without warning me “if it is rejected it won't be my fault”. I then had to upload the passport of my husband under the ‘Proof of Indian Citizenship’. And finally I leave with a file number in my pocket! But it would have been too easy wouldn’t it? Two weeks later I get an email asking me to resubmit my marriage certificate. And when I comply, they explain to me that the words ‘marriage certificate registered under Special Marriage Act, 1954’ are missing on my certificate made in Mumbai. And then, the fun part begins. a. We go to the Marriage Court of Gurgaon to register our marriage again. It’s illegal. b. We try to find an agent who could get our certificate modified in Mumbai. The Bandra court replies that it is the standard certificate there and they won't change it. But maybe we can have them sign an affidavit. Except that the guy who married us has just be transferred and his replacement is on leave. And on that the agent stops picking up the phone. c. We are still left with the option to re-register our marriage by getting married again, as per lawyers’ advice. But not in Gurgaon because the system has changed and one can no longer corrupt them. No, we would have to go to Ghaziabad and go take pictures at the temple and pay 15 000 rupees. I would do it for the experience you can imagine, except that it seemed a little too crazy... And I could really picture the scene where my marriage would be registered in 2016 and not in 2014 and I would have to wait another two years to apply (even though I was assured that antedating the document would not be a problem). d. In despair, I thought I would send my favorite Indian plead our case in Mumbai. Two days later, I'm not lying, I received a message stating that my application was approved and I had to send a new DD (the former having expired). I could not believe it. But the next day an officer showed up at my place – a normal procedure where they check that I live here where I say I live. And three days later I was officially an (Overseas) Indian Citizen! 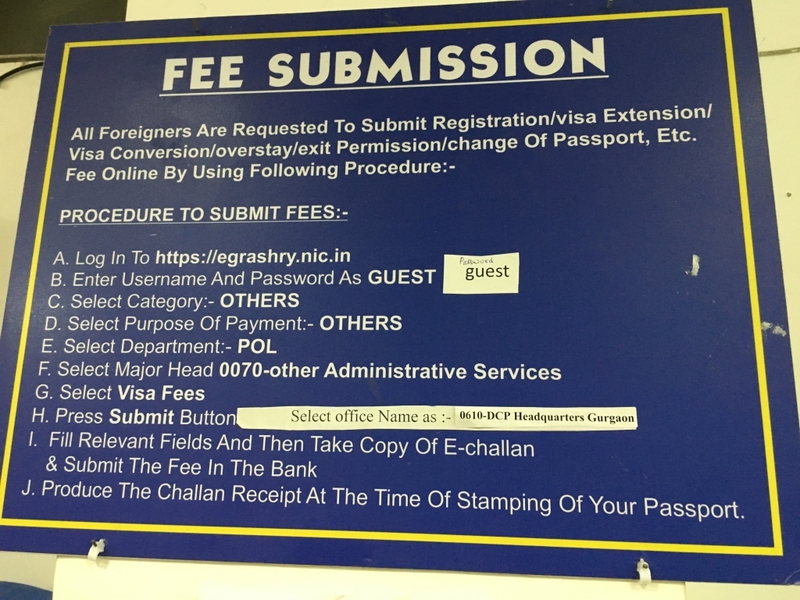 If you are a foreigner holding an employment visa and working in Gurgaon, this message is for you! How to get your registration in 4 steps (and only one trip). First of all you need to know that you have to register yourself, within 15 days of arrival. If not you may (or may not) have to pay a fine. To register yourself, you need to go to Mini-Secretariat near Rajiv Chowk, in Gurgaon. Go there early. It opens a 9:30 and they take papers up till 1 PM but you may want to be there at 9. But be careful, don’t go just like that! Once you are there, they will tell you to make a payment (I had to pay 1,990 rupees). Practically, you go out of the building, ask for an internet café, cross the ward where all the lawyers sit, get to the internet café, make a payment online (insist if he says it is not possible), print a challan and go back to the FRRO office. Alternatively, you can run around like a mad chicken, go to a State Bank of India with your challan, only to realise you don’t have to. Unless you do a cash payment. Once you are back in the FRRO you show your papers to the guy. Then to another guy. Then back to the first guy to get a token number. Then wait. Then give your papers, sign and give to the second guy to sign. And get the hell out of there! (And carry this document whenever you travel abroad). 2. Important: you can’t stay more than 90 days with a 1 year tourist visa! 4. Important: You can’t stay more than 30 days with this visa in India! Important: Anyone staying more than 6 months in India has to register to the local Foreign Registration Office.